The Listening Gallery is a new collaborative project between the Baroque Music Festival and some of the finest Artists, Galleries and Antiquarians in the area. This event is a fundraiser for the Festival and the participating artists will donate a percentage of the auctioned price for their works to the Festival. Each year, one of our participating artists will be selected to elaborate the poster image for the festival. The selected image will be used in all Festival publicity. The Listening Gallery pairs submitted objects of art with musical interpretations performed by soloists and musicians from Mexican Universities and Conservatories. The Listening Gallery offers visitors to the Baroque Music Festival a multi-sensory way to experience the objects on display. It will illustrate the relationship between art and music by making direct interpretations between the exhibit pieces and the improvised musical response. While looking at a contemporary interpretation of a scene from the Royal courts, visitors to the exhibition will be able to hear music that was composed for that occasion. 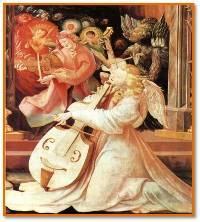 A Mexican altarpiece would be displayed with Mexican mass music from the same period. The opening performance of the exhibit music will be recorded and will be available to listen to in the exhibition throughout the Festival week and on our website. Bidding on the exhibited pieces will commence at the opening of the Festival and final bids will be taken on the last night of the Festival at the Gala dinner.